Do you like golf? So, what about winter golf? Yeah! Here everything is real! Just use the mouse to play and hit your target. Do you think that it is so easy? Well, then do waste your precious time and take part here. Do you think that it is so easy? Well, then just try it. Have fun. There are 20 challenging levels you start with some basic puts to get the hang of the game but move on to more challenging mini golf holes. Just watch out for holes in the course, spinners, spring boards, crazy gaps and Polar bears, cause it's a real challenge to finish the game but still fun of course. 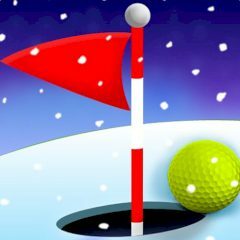 Mini Golf really never has been so fun, Winter Golf combines the classic elements of play with easy to use touch controls, stunning graphics and some truly unique level design which will make your jaw drop, or at least take a few extra shots anyway and just have fun here!